Proper Winter Home Maintenance Includes Steps to Prevent Ice Dams. There’s nothing cozier than a warm house in wintertime. In order to ensure that your residence can serve as a refuge from the ice and cold, there are certain things you should do in preparing for winter. While some of these you can accomplish on your own, others require help from a reliable professional. As the days of fall begin to slip away, you’ll want to make sure that you perform the basic acts of winter home maintenance. The first thing you should do is confirm the good repair of your central heating. Any provider of quality heating services in Georgia can perform a thorough inspection of your HVAC. Few things feel worse than the abrupt failure of a furnace on a particularly chilly day. Once you’ve gotten that taken care of, consider these other elements of winter home maintenance. 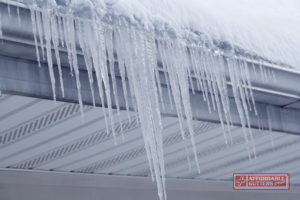 In order to protect your roof from the devastating effects of ice dams, consider the installation of an ice dam membrane to work in conjunction with your drip edge. You may also explore ways to prevent the escape of warm air from your attic. Methods could include attic insulation, or ventilation on your soffit. At Affordable Gutters Plus LLC, we offer a variety of roof services. As for winter prep, clean gutters are very important to allow the proper drainage of rain and melting ice. For professional service with this aspect of winter home maintenance in Canton and Roswell, GA, give us a call at 770-735-4433. Posted in Uncategorized on October 11, 2018 at 9:38 pm by Affordable Gutters Plus LLC.